Dolphin Nautilus CC vs Nautilus CC Plus: Which One’s Best? 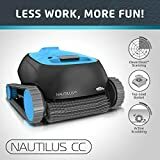 It’s probably no surprise that the Dolphin Nautilus CC and Nautilus CC Plus are basically the same robotic pool cleaner, but that the Plus model comes with a couple of little extras … and a little extra cost. Both of them are excellent robotic pool cleaners that are highly regarded by other pool owners and based on a design that when it hit the market was a difference maker. Both will clean a pool quickly, and both are capable of scanning a pool and coming up with an optimal path that includes getting around obstacles on the bottom. Unlike other top-shelf robotic pool cleaners, these won’t break the bank. The choice of which one to buy comes down to a pretty simple calculation. Do you want to pay a little more for the extras, or do you just want the cleaning performance of the basic model? The choice of right pool cleaner depends not on a list of pros and cons but on how much Dolphin Nautilus a pool owner wants to pay for. The performance advantage is really pretty basic here. Both cleaners have the same Clever Clean feature that scans a pool and creates an optimal cleaning course that maximizes time. Both have access to the same filters and the same scrubbing technology. Both can cover the same basic portion of a pool. The CC Plus has a longer power cord so that it can cover more pool. It also has a better tangle-free operation and slightly larger filters. For pretty obvious reasons, it gets the edge. We hate to sound like a broken record here, but these two models are the same basic cleaner, but with a few extras for the CC Plus. It follows that the CC is more affordable. You’re paying for less. Sometimes, when two models are pretty different and have different prices, it’s warranted to devote a little time to sort out which one is a better value and for what reasons. In this case, if you want Dolphin Nautilus-quality cleaning, you can get it for less with the CC. Neither model has the advantage in terms of durability, because they are basically the same frame. While there are some subtle differences in features and add-ons, none of these were intended to affect the overall durability of the cleaner and none do. So, no advantage. This, again, is pretty intuitive. The CC Plus is designed to be a slightly better pool cleaner than the CC. It is a little bigger, but it also has slightly bigger filters and a slightly longer attached power cord. It can handle a larger pool, as a result, and clean longer between maintenance downtime periods. Under those circumstances, the advantage just simply rests with the CC Plus. The Dolphin Nautilus CC is a great basic robotic pool cleaner. It comes with the Clever Clean system that utilizes onboard sensors to map out an optimal cleaning path in a pool and that once in operation can detect obstacles and move around them. It is fast and can clean walls as well as it can clean a pool floor. Unlike other top-performing robotic pool cleaners, it won’t break the bank in doing the job. It’s about the same cost as a good pressure-side pool cleaner and comes with the added bonus of not requiring the additional purchase of a booster pump. It’s called the CC Plus for a reason. It takes all the great things about a Dolphin Nautilus CC and adds to them. It’s got the great Clever Clean system that can map out the best, fastest route to cleaning your pool and when in operation can dodge obstacles. It’s got a dual-layered filter system that sorts large debris from grit, making for faster, easier cleaning and return to action. The CC Plus takes those features and to them adds a slightly longer power cord for greater reach, and slightly larger filters to either accommodate a larger pool or just to make life just a little easier for pool owners. It also won’t break the bank to make this happen. Both the Nautilus CC and the Nautilus CC Plus are great robotic pool cleaners. They both come with the Clever Clean feature that scans a pool to optimize the cleaning path around it and can dodge around obstacles on a pool bottom before returning to the originally charted path. They both clean walls and floors with equal quality and come with a dual filter system that helps separate debris by size for easy cleaning. For top-performing robotic pool cleaners, neither will break the bank. What separates the two is pretty obvious. The CC Plus comes with features that cater to a slightly larger pool. It has a better tangle-free operation, which helps at every level, but it also has slightly larger filters and a slightly longer power cord. If your pool is a little larger, it’s the model you’ll absolutely want. Beyond that, the choice between the two comes down to whether you want to pay a little more for a little more. The difference is, considering the overall costs of maintaining a pool, pretty small, but the desire to operate on a budget is also pretty laudable. If money is no object or you really want a pool cleaner that requires a little less attention, you’ll want the CC Plus. 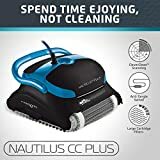 If you just want the Dolphin Nautilus’ excellent cleaning performance without any bells and whistles, the CC is the model for you. Types of Pool Cleaners: Robotic vs Suction vs Pressure – Which is Best for You? Polaris Vac-Sweep 280 vs 360: Which One’s Best? Polaris F9450 vs F9550: Which One’s Best? Polaris 380 vs Polaris 3900: Which One’s Best? Polaris 360 vs 380: Which One’s Best? Dolphin Triton vs Nautilus: Which One’s Best? Zodiac MX6 vs Zodiac MX8: Which One’s Best?